Dr. Hoy has achieved credentials as a Certified Medical Manager from the Professional Association of Health Care Office Management. He has been the President of the Downtown Foot and Ankle Center since 2004. 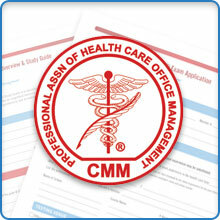 The accredited CMM Credential demonstrates commitment to excellence in health care office management. Twenty four continuing education hours are required every two years to maintain this credential. Safety, security and compliance are issues of paramount importance to medical offices – the custodians of your health information. Many offices choose to help ensure that they stay compliant with the latest rules, regulations and laws with certified managers who are the best the industry has to offer… CMMs! The Certified Medical Manager (CMM) Certification is nationally recognized as the standard of excellence in physician office management. CMMs have demonstrated that they have (and maintain) the knowledge, skills, and experience necessary to successfully manage today’s ever-changing medical practices. This practice recognizes the importance of having those skilled, certified managers leading their offices, safeguarding the needs of both the practice and the patients. In addition to his two medical and surgical board certifications, Dr. Hoy is also certified by the American Institute of Healthcare Compliance. The credential of Certified Healthcare Billing Specialist was earned in 2012, and Certified Healthcare Collections Manager was earned in 2013. These certifications reflect the commitment of our office to clinical and administrative excellence.